The James Bond film franchise wasn’t in a good place in 1994. There had been no 007 film in five years. Eon Productions co-founder Albert R. Broccoli had been in a legal fight with Metro-Goldwyn-Mayer. Broccoli had put Eon up for sale before taking it off the market. The producer wasn’t in great health. He had decided that 007 veterans John Glen and Richard Maibaum would not continue laboring on Bond. In short, everything was up for grabs. Broccoli yielded primarily responsibility for overseeing Bond 17 to his stepson, Michael G. Wilson, and his daughter, Barbara Broccoli. But if the cinematic Bond was going to make a comeback, somebody had to step up. That somebody was screenwriter Michael France, who died last week at the age of 51. “I decided I wanted to be a writer when I was watching Goldfinger,” France was quoted by Steven Jay Rubin in his The Complete James Bond Movie Encyclopedia’s updated 1995 edition. “When I was a kid, I wanted to be Richard Maibaum, not Bond.” According to Rubin’s account, he was given the chance to come up with a script in March 1993. In 1994, France delivered a first-draft script. It took a real-life event, a 1993 attack on the World Trade Center in New York, and went from there. There was no way to know it at the time but France’s script was prescient because on Sept. 11, 2001, the towers were brought down by a terrorist attack. France’s script wasn’t the last word. Other writers revised his draft. France only got a “story by” credit while Jeffrey Caine and Bruce Feirstein got the “screenplay by” credit. Only Feirstein was invited by Wilson and Barbara Broccoli back for the next Bond film. Feirstein’s FIRST DRAFT also got revised, much the way France’s GoldenEye initial draft was. Still, Feirstein got the sole screenwriting credit for Tomorrow Never Dies. That’s show business. The fact remains that the cinematic Bond was dead in the water until Michael France delivered his script. By that time, Richard Maibuam, the dean of 007 scriptwriters, was dead. Cubby Broccoli was in failing health. And the future of the cinematic Bond was far from assured. The work was far from complete. But Michael France gave everybody a starting point. For that alone, his contributions to the film franchise are huge. Michael France, one of the screenwriters of 1995’s GoldenEye who devised the film’s original plot, has died, according to an OBITUARY IN THE TAMPA BAY TIMES. ST. PETE BEACH — Hollywood screenwriter and Beach Theatre owner Michael France was discovered dead at his St. Pete Beach home Friday morning after an extended illness, his sister said. He was 51. In recent years Mr. France struggled with diabetes that impaired his left arm and right leg. Nine months ago he was found comatose at his residence by his sister, who also discovered his body Friday. We’ve written before how France’s FIRST DRAFT of GoldenEye included a planned attack on the World Trade Center in New York years before it occurred in real life. In the France draft, the villain was Augustus Trevelyan, the predecessor to the Bernard Lee/Robert Brown M, who defected to the Soviets. France ended up with only a “story by” credit in the 1995 James Bond movie after his script was worked over by Jeffrey Caine and Bruce Feirstein (credited with the screenplay) and Kevin Wade (who didn’t get a credit). It was France’s only contribution to the series but it was a key one. 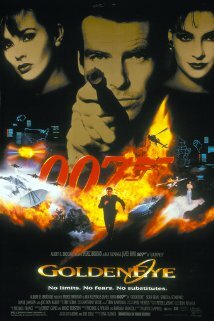 GoldenEye kick started the Bond franchise after a six-year hiatus and there were plenty of doubters at the time whether 007 could make a comeback. Still, of the GoldenEye writers, only Feirstein got invited back for an encore by Eon Productions.